The annual Tony Forristal/Sonny Walsh U14 hurling competitions were held recently in Waterford and Ballincollig was ably represented by Killian Lee in the Sonny Walsh team. 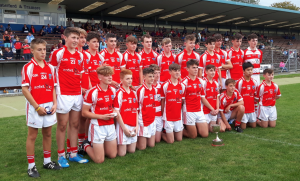 These competitions are the first introduction of players in their respective County development squads to an All-Ireland competition which is run in a blitz type format over the day. 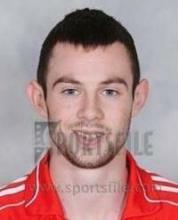 Cork's Sonny Walsh panel were in a group with Dublin and Kerry which they qualified from by the tightest of margins. After that they found a vein of form that saw them beating Galway convincingly in the semi-final and again winning well in the final against a spirited Kildare team on a scoreline of 5 - 14 to 1 - 7. Killian more than played his part and will have the treasured memory of scoring a goal in the final to add to some fantastic displays during the day. Killian's success last Saturday is testament to the hard work he puts in for his club week in week out ever since he came down as a shy (well, that's probably stretching it a bit!!) 5 year old to our Youth Development training those short few years ago. As one of the most consistent trainers we have, it is no surprise that he earned his just reward last week and hopefully he will inspire some of the younger boys that if you keep up your training anything is possible. All of this of course would not be possible but for the large group of team mates that he has on the U14 panel and because of the success they are having as group it has put them all in the spotlight around the county. So to Killian we say well done on your remarkable achievement and let's hope it will to further success for you and also to the U14 group as a whole.